Yeshivah students from Safed dance with IDF troops in Metulla prior to an operation in which the troops destroyed a 40-meter-long-tunnel built by the Iranian-backed terror group Hezbollah. The tunnel started in the Lebanese town of Kfarkela and snaked its way into Metulla, an Israeli town of 1,000 surrounded on three sides by Lebanon. On Monday, the second night of Chanukah, 15 Chabad-Lubavitch yeshivah students from Safed, Israel, headed 45 minutes north to bring holiday observance and cheer to Israeli troops based in the Lebanon-border town of Metulla. The visit had been pre-arranged weeks earlier, but when they got there, they found only a handful of soldiers milling about. Little did the students know that they would be providing the spiritual preparation for troops embarking on a dangerous mission to destroy a terrorist tunnel that reached from Lebanon into Metulla. Not a moment went by before a few dozen Israel Defense Forces’ soldiers spilled out into the common area. That’s when the singing and dancing began, olive-green and black-and-white in a whirling embrace. 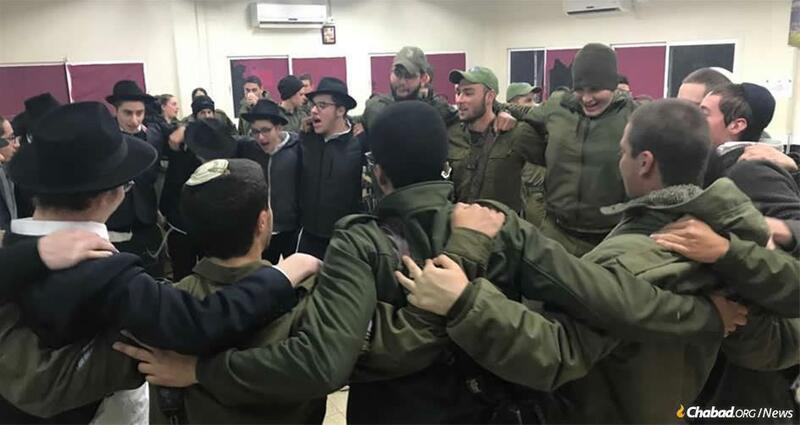 As has become custom on Israeli military bases from the north to the Negev, the Chabad yeshivah students were there to share the joy of the holiday. They distributed sufganiyot, or jelly doughnuts, to each soldier, gifted them with tin menorahs and arranged a large menorah-lighting for the group. 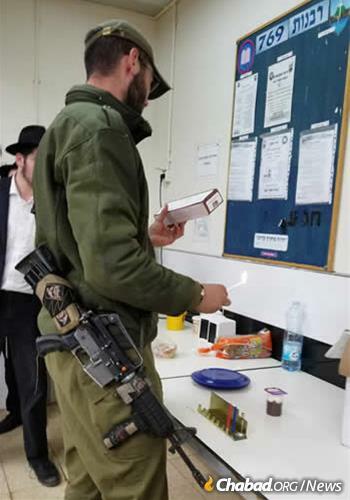 A soldier recites the blessing over the Chanukah menorah. The Metulla visit was not the yeshivah students’ only venture to the northern border this Chanukah. Over the first three nights of the eight-day holiday, the 50 students of Yeshivat Tzeirei Hashluchim in Safed have visited 30 bases along the Lebanese border and the Golan Heights. According to Sruli Brook, 20, of Brooklyn, N.Y., the students have distributed more than 2,000 doughnuts so far and kindled hundreds of menorahs. Deren and his group spent the first night of Chanukah visiting bases near Rosh Hanikra, where they similarly danced and sang with soldiers. As the night got late, they walked through the barracks giving out doughnuts and lighting menorahs with soldiers who were preparing to retire for the night. As the yeshivah students prepared to leave, one soldier pointed to a lookout. Meanwhile, not too far away, a group of the students were on their way back to Safed after a long evening. They had managed to visit a few bases, but due to a miscommunication had been denied access to the last one, leaving them in low spirits. As they drove down the long, dark highway, their driver noticed a lonely Jeep with a few soldiers sitting on the side of the road. The students were led straight to a group of 60 young new conscripts, 18-year-old rookies just starting their training. They were in a field, in the dark and cold, in the middle of a 36-hour hike. What could be better than a providential midnight meeting with dancing yeshivah students bearing fried treats, snacks and candles? Soldiers were gifted with tin menorahs. Hike or no hike, field or no field, the group lit the menorah, singing the blessings and the songs in one group, together. The intrusion was not only allowed by the commander, but encouraged. The next morning, yeshivah student Saadia Liberow texted pictures of the midnight encounter to one of the soldiers with whom he had exchanged numbers. Students arranged a large menorah-lighting for the group. Yeshivah students distributed “sufganiyot,” or jelly doughnuts, to each and every soldier. Students shared insights and inspiration for the eight-day holiday.